The American Classic Blueberry Pie combined with my favorite… Plump,Rich. Red Raspberries. Any pie can be much easier if you use a pre made piecrust. This pie takes 2 crusts, a top and a bottom. These are two pre-made crusts that are my first choice when I’m in a pinch for time. Trader Joes has a great product if your in the US and if your in the UK, Waitrose is my go to. Roll out 2 piecrusts on a floured surface and fit one into a 9” pie plate. Combine first 4 ingredients in a large bowl . Add berries and gently mix. Top the filling with a few pats of butter. Cover berries with remaining piecrust. Crimp to connect along the edges. 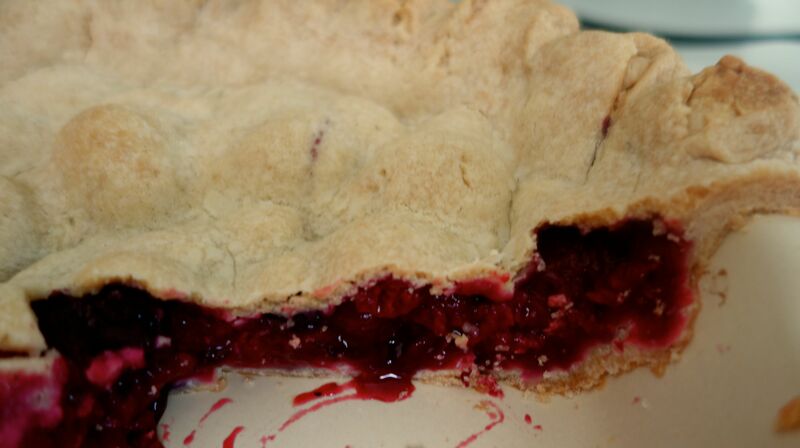 Score the center of the top of the pie with a 2×2” “X” cut to allow steam to release during baking. Edges have a tendency to burn so cover edges of pie with foil until the last 15 minutes of baking . This entry was posted on Friday, May 23rd, 2014 at 5:11 am	and posted in Category. You can follow any responses to this entry through the RSS 2.0 feed. « Devil Dogs …the Cake !